Oloshas United, look for things going on where you live! What a wonderful movement. Oloshas uniting to do all sorts of beautiful ceremonies, prayer circles, song and dance classes, all over the world and a commitment to wearing white from the 10th of December 2014 to 21 December 2014. Why am I supporting this movement? I think it is important to create a different kind of energy uniting us all over the globe to do spiritually motivated things which down the cooling energy of Obatala. It makes us feel less helpless in the face of war, hunger, injustice and illness. I am sure we are all doing what we can on an individual level. This is just adding an extra dimension. Our spiritual path is as much to do with community and lineage as anything else. We are all connected around the globe. Using our life force, our Ashe in a positive way, we can see to achieve a different type of energy for next year. Focusing on Peace, on Justice, on good health and practical and sensible solutions which do not discriminate, I am standing in solidarity with all who support this Peace and Healing initiative all over the world. The London Lucumi Choir will be holding an open session at the Premises Studios ( 3) on Hackney Road, nearest tube Old Street from 11. am to 2pm on the 14th December. 2014. Message me for more details. We will be singing songs to Obatala and Babalu Aye. 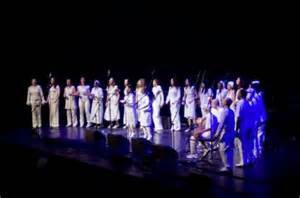 We always wear white when we perform, and hope that you will join us in wearing white on Sunday. a photo taken of me taking photos!